Awesome smoothie recipes! Become radiant one smoothie at a time! Ready for some fast nutrition that will energize the cells in your body and your brain? These simple and unique smoothie recipes can be your answer in this fast pace world. Just imagine... You can transform your health and boost your energy through the roof with a simple drink every day! Blend it. Drink it. See the difference! Let this step-by-step smoothie handbook show you how. Hi! My name is DaNae. 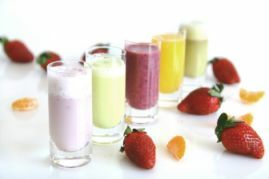 My love affair with smoothies started when I was a manager for a smoothie franchise many years ago. 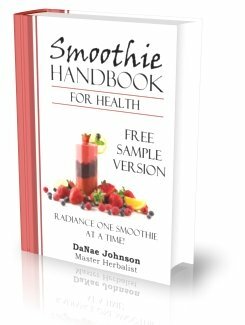 My eyes were opened on how to make a smoothie in a variety of ways to improve my health. But I saw that the smoothies served to the customers in the shop were missing a lot of the micro-nutrients and while adding LOTS of sugar. So I started experimenting with my own home blender to make a delicious fruit smoothie and haven’t stopped. 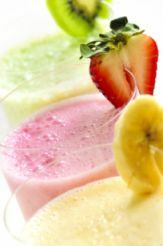 Did you know that you can even make dessert smoothies for boosting your immune system? Incredible! Between my training as a Master Herbalist and my own research and experience, I realized that my blender was one of the best investments to rejuvenate my health. Fats, fruit, greens, and supplements (like Enerfood) are easily incorporated into these healthy smoothies without compromising the flavor. Now, I no longer work at the franchise. I homeschool my two young boys and toddler girl. My “regulars”, my family and friends, eagerly come with cup in hand whenever they hear the blender running. The health of those "regulars" have kept my passion for smoothies burning strong. Even during the winter months, smoothies are a key meal in my family's diet. Through the years, I have learned how to make nutrient dense recipes at home that both kids and adults will love. Because of the awesome benefits of smoothies, I teach health classes on how to make simple changes to drastically revolutionize your body's performance. This easy concept should not be kept secret. Please, let me show you how easily these life-changing smoothies can be incorporated into your lifestyle. Explore new ideas... Use that blender of yours! Open your eyes to the many possibilities to improve your health. Become Radiant One Smoothie at a Time! Plus, you'll receive my top-secret smoothie tips on your digital doorstep! Join over 23,000 other people and stay up to date on delicious smoothies and healthier living! My purpose is to provide you super smoothie ideas in my newsletter. I will never sell your information or send you a bunch of spam.